The Local History Room at the Decatur Public Library will collect, organize, preserve and provide access to a non-circulating collection of primary and secondary sources that document the history of the City of Decatur. The Local History Room at the Decatur Public Library will collect, organize, preserve and provide access to a non-circulating collection of primary and secondary sources that document the history of the City of Decatur, its inhabitants, government, environment, businesses, institutions and organizations. Materials related to the history of Macon County, its communities and Illinois will also be maintained in cooperation with other historical, genealogical, archival and library collections in the area. Items may be accepted in any format, including manuscript, printed, or digital. Photographs and documents may be removed from their frames if accepted into the collection. Three dimensional artifacts will not be accepted by the Library unless they can be properly housed and are deemed appropriate to the collection. The Library reserves the right to refuse an offered donation. The Library will not accept material that can harm other material in the collection, such as anything that shows damage from mold, mildew, water, insects, smoke, or dirt. The Library may also decide not to accept items which it cannot properly store, display, or otherwise care for. The Library will assist the donor in finding a more suitable institution for their material. Because history is created daily, materials that enhance the mission of the Local History Collection and meet the selection criteria will be accepted by the library. The Local History Room staff will not create any new historical documents, only collect, preserve, and make accessible those created by other people and/or organizations. In order to establish the transfer of ownership, the Library requests that a deed of gift be completed by the donor/representative and the Local History Librarian/Archivist. The deed of gift documents the donation of property and transfer of copyright (if applicable) to the Library, and is signed by the donor. It also includes a complete description of the donated item and information regarding past ownership of that item. The deed of gift also establishes conditions (if any) governing the transfer of the title from the donor to the Library. Once the deed of gift is signed by the donor, the donated item becomes the property of the Library. Loans for exhibits may be asked for from time to time, but no permanent material loans will be accepted by the Local History Room. The Library will only accept material with access-limiting restrictions when the restrictions are reasonable and necessary to protect the legitimate rights and interests of the donor. Any restrictions will be recorded on the deed of gift, and will be adhered to by the Library. All restrictions will specify a date when full access will be granted. The Library reserves the right to decide how the donated material will be displayed or stored, how the item may be used by the public, and how long the item will be retained. Materials in the local history collection (especially photographs and negatives) may be scanned and placed on the Internet for viewing, may be moved from the local history collection to other sections of the library, may be sold, or may be transferred to another library (See Reappraisal and Deaccession). From time to time, the Local History Collection will be reappraised, and the deaccession of some materials may take place. The Library will offer the deaccessioned materials to appropriate institutions or return them to the donor, depending on requirements of the donor’s deed of gift. 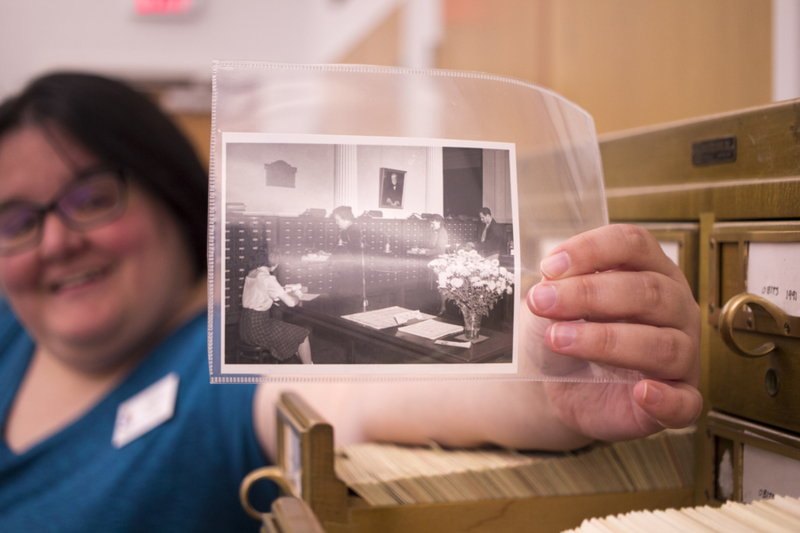 The Local History Room at the Decatur Public Library strives to organize, preserve, and provide access to its collection according to standard archival procedures and practices. A finding aid (a description of a collection with a content list) will be prepared for each collection, and will be accessible to the public. The materials in each collection are organized according to the original order (when applicable), and placed in archival containers. The Local History Room will follow the security practices and disaster planning set by the Library to protect the collection from potential loss or damage. The Library will not conduct any monetary appraisals for donors.